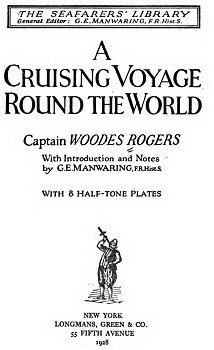 Captain Woodes Rogers : Baja California, 1709. New York : Longmans, Green & Co., 1928. Bark logs used by the fishermen of the Baja Peninsular, California. While the construction or design of these craft is not rigorously described, they certainly were not canoes. They are clearly depicted as rafts in Woodes Rogers landing on the coast of California (1770), page 208. Woodes Rogers (ca. 1679 – 15 July 1732) was an English sea captain, privateer, and, later, the first Royal Governor of the Bahamas. He is known as the captain of the vessel that rescued the marooned Alexander Selkirk, whose plight is generally believed to have inspired Daniel Defoe's Robinson Crusoe. Cruising off Cape St. Lucu. Before Sun set last Night we could perceive our Bark under the Shore, and having little Wind she drove most part of the Night, that she might be near us in the Morning. We sent our Pinnace, and brought the Men aboard, who told us, that their new Acquaintance were grown very familiar, but were the poorest Wretches in Nature, and had no manner of Refreshment for us. but this Account can't be depended on, and I choose to believe it joins to the Continent. Account of its Shape or Bigness, and having seen so little of it, I shall refer the Reader to our common Draughts for its Situation. What I can say of it from my own Knowledge is, That the Land where we were is for the most part mountainous, barren and sandy, and had nothing but a few Shrubs and Bushes, which produce Fruit and Berries of several Sorts. Their Arms are Bows and Arrows, with which they can shoot Birds flying. Their Bows are about 7 Foot long, and of a tough pliant Wood unknown to us, with Strings of Silk Grass; their Arrows about 4 Foot and a half, made of Cane, and pointed with Fish Bones that they shape for the purpose. Most of their Knives and other cutting Instruments are made of Sharks Teeth. The Natives grew very familiar with us, and came frequently aboard to view our Ships, which they mightily admir'd. We saw no Boats or Canoes among them, nor any other Sailing Craft, but Bark-Logs, which they steer'd with Paddles at each End. "We saw nothing like European Furniture or Utensils among 'em. Their Huts were very low, and made of Branches of Trees and Reeds, but not sufficiently cover'd to keep out Rain. They had nothing like Gardens or Provisions about them. They subsisted chiefly on Fish while we were here, which with the Miserableness of their Huts, that seem'd only to be made for a time, made us conclude they had no fix'd Habitation here, whatever they may have elsewhere, and that this was their Fishing Season. We saw no Nets or Hooks, but wooden Instruments, with which they strike the Fish very dextrously, and dive to admiration. Striker with a Fish on the Point of it, which was taken off by another that watch'd by him on a Bark Log. The Reader may believe of this what he pleases, but I give it the more credit, because I my self threw some rusty Knives overboard, on purpose to try those Divers, who seldom miss'd catching a Knife before it could sink about 3 or 4 Fathom, which I took to be an extraordinary Proof of their Agility. Geoff Cater (2014) : Captain Woodes Rogers : Baja, California, 1709.